The Lincoln Center for The Performing Arts was planned not only to create a major new cultural center for the city but also as an important urban renewal project for the Upper West Side. 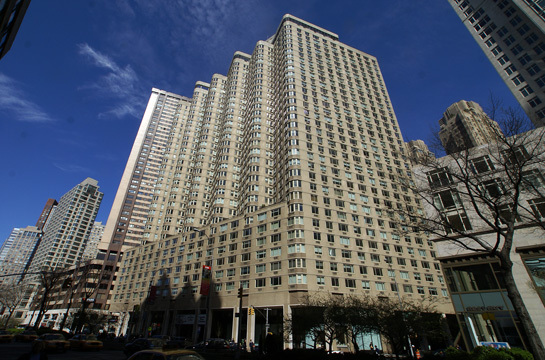 Two of the most important major private projects to be developed in the area after the center opened were built by the Milstein Organization, this building and the 40-story tower at One Lincoln Plaza at 20 West 64th Street. Both were major apartment buildings facing the center along the east side of Broadway. Both were designed by Philip Birnbaum and generated considerable controversy when they wre built because of their large size and their design. This was the second of the two. Both the Milstein buildings are interesting and not without their urbanistic virtues, even if they are not masterpieces. They both have high arcades along Broadway and towers that maintain the angled "street-wall" of Broadway. They also both have fairly unusually massing by Manhattan standards. 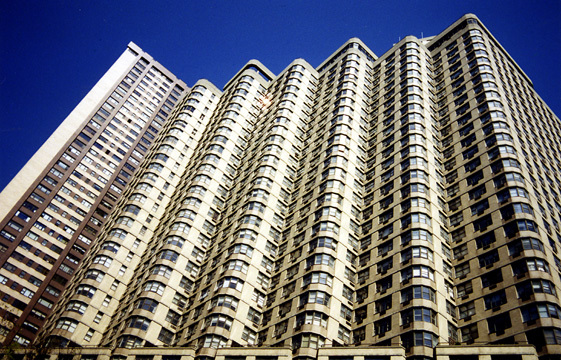 The first building, One Lincoln Plaza, is a condominium and was erected in 1974. It has a relatively plain facade that is patterned with vertical accents with beige and dark brown bricks. 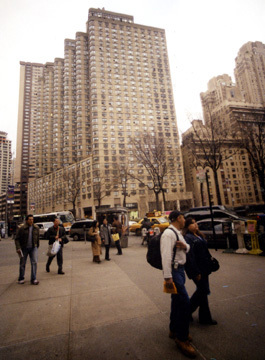 This beige-brick building is far more complex as its Broadway facade is divided, above the arcaded base, into six rounded piers that provide many bay windows, probably more than on any other residential building in the city. 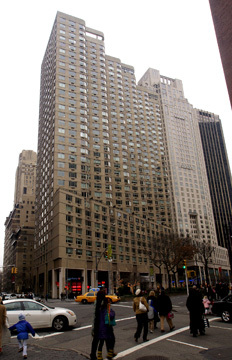 While the proportions and quality of finish are not highly refined, the overall form is interesting and a good contributor to the architectural eccentricity of the area, especially since it is not far from the Century apartment building on Central Park West that has some rounded forms at the rear of its twin towers. 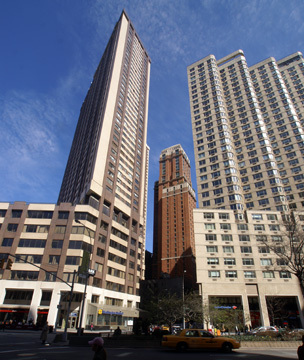 While this building cannot compare with the architecturally distinguished bundled cylindrical form of the Corinthian apartment tower at First Avenue and 38th Street, and that of Lincoln Plaza Tower at 44 West 62nd Street, it has a much more desirable location and is significantly better than many other projects of its era. If it were clad in reflective glass and had bay windows also on its south side and a slightly taller profile, it would be one of the city's more impressive buildings. Its arcade has lively retail activity that includes a small but excellent magazine store and a cineplex. The middle of the arcade has a broad entrance to the development's large and attractive mid-block plaza that is lushly landscaped and has a water element. Despite the fact that much of the plaza is often in the project's own shadow in the afternoon, it is one of the more popular in the city and a surprising and quiet oasis in this quite busy neighborhood. The 33-story building was erected in 1980 and there are 21 apartments on most floors. There is a doorman and concierge, a garage, a driveway, a bicycle room, valet service and laundry facilities on every floor. The building has discrete air-conditioners and consistent fenestration. 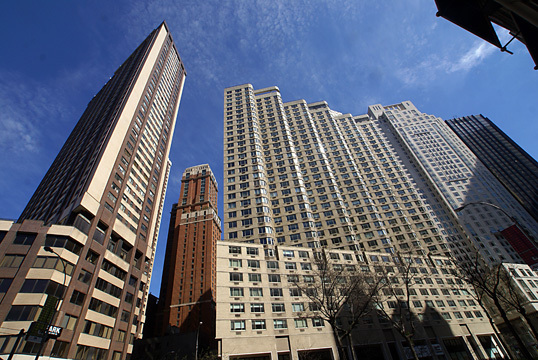 The building is also known as 1884 Broadway, 21 West 62nd Street and 22 West 63rd Street. This neighborhood has been steadily improving and offers convenient public transportation and an abundance of restaurants and excellent shopping. Central Park is a block away to the east.